How beautiful is honeycomb?! I’m not even a huge fan of honey, but I want to just dive right into this. Plus, there was a wasp buzzing around – bonus! In the morning take a piece of toast, spread a little peanut butter on it, then a little honey, and then top it off with some cinnamon, you’ll love honey for ever after! Ah, but my issue with honey is the sweetness, not the taste, so I’m not sure your solution is going to work for me… Perhaps if I put honey on a piece of toast with my unsweetened peanut butter? I’ll give it a try and report back! Ooh, you likely ARE getting honey from your own clover! Nice. Local honey is the best! I was given some local Raleigh honey not too long ago. 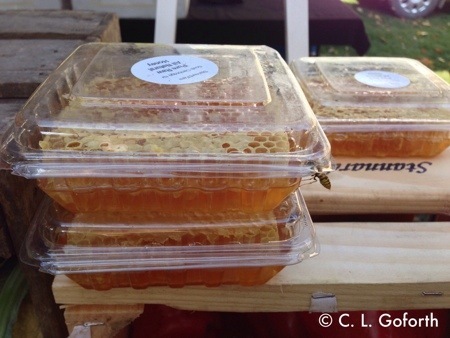 It’s always awesome to get local honey, straight from the beekeepers! I love buying local honey, it’s amazing that it comes from so much hard work of the bees! Agreed! Plus, its delicious. I just wish I liked it on more things or had a higher tolerance for swwets. I can’t eat much of it! I take it that you like honey! Yeah, I haven’t had a lot of time recently. Will get back to blogging soon – I hope! Ha ha! Yeah, trust me, I’d rather be blogging than doing a lot of the things that are sucking up my time. I swear it’s one emergency after another recently. Hoping to get back into my regular groove soon!